Following the success of our tour of FRIEZE Art Fair last October, the YCL Art Circle is proud to present discounted tickets for YCL members who want to attend ART14, but are unable to make the guided tour of the international contemporary art fair ART14, followed by lunch! ART14 London is the second edition of London’s global art fair sponsored by Citi Private Bank. The inaugural edition of the fair in 2013, attracted 25,000 visitors, including 4,500 VIPs. It was a success with critics, galleries, collectors and art fans alike, with Wallpaper praising the fair’s ‘impressive scope‘, while the Financial Times reported on Art13 London’s ‘refreshingly different‘ approach. Book your ticket online at www.artfairslondon.com and receive a 2-for-1 offer on Single Adult tickets. Quote 'YALE' when prompted to redeem this offer. 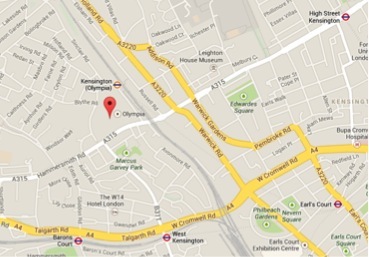 The best way to get to Olympia is the Kensington (Olympia) stop on the District Line (variable operating times) or via the London Overground.